Our experienced team has been together for years, and they are committed to working with you and your family to create a comfortable, stress-free, and rewarding dental experience every time you visit our practice. We can't wait welcome you to our Downtown Miami office, and we look forward to working with you. I am the first voice you’ll hear when you call and the first face you’ll see when you come to our office. Not only do I fill the scheule, I'm also a certified dental assistant, and it's not uncommon to see me in the back taking digital x-rays or helping Dr. Weiner with a ZOOM whitening procedure. I love working here, and look forward to seeing you at your next appointment. I’ve been with Dr. Weiner since pretty much the beginning. I’m proud to say that after 28 years, I know almost every patient personally, and very often, they call the office and ask for me by name. For me, the ability to build and maintain connections with our patients is what makes coming to work every day a true pleasure. 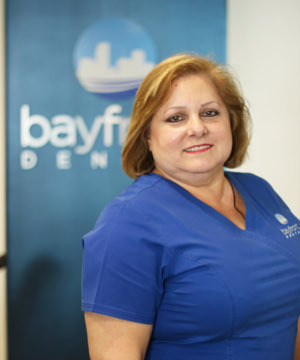 Not only do I work at Bayfront Dental, but I have been a patient here since I was three years old. In addition to working part-time as a patient coordinator, I attend college and am pursuing a career as a nurse practicioner. I have worked on the busines side of dentistry since I graduated high school. As a result, I know the ins and outs of dental insurance, and can help you with any of your billing or insurance questions. The most rewarding part of my job are the long-term relationships I have with our patients, some for more than 20 years, and our team too. We’ve been together forever and have watched each other’s kids grow up. It’s gratifying to work in an environment that feels like family, and always has. My greatest joy is making people happy. I love interacting with our patients and making sure they are comfortable. Taking care of our patients and being part of a great team is what makes my job so rewarding. I look forward to meeting you! I have been Dr. Weiner’s lead hygienist for 25 years. Over the years, I have taken every opportunity to enhance my dental knowledge, communication skills, and clinical know-how, and I have been very successful in helping patients keep their smiles healthy. I love working with patients and translating clinical terms into everyday language so people can fully assess their treatment options and make the best decision for their clinical care. It’s gratifying to know I am positively influencing their lives by improving their oral health. 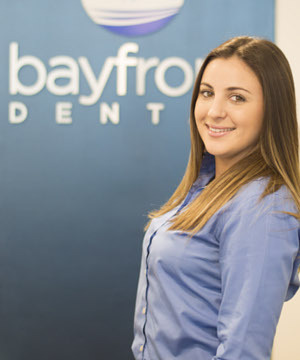 I started working at Bayfront Dental in January 2017, and I couldn’t be happier. Dr. Weiner’s practice has allowed me to engage my highest-level skills in hygiene and patient education. I specialize in soft-tissue-management, which means that your gum health is always a priority! I enjoy teaching my patients and inspiring them to take the very best care of their teeth and gums.